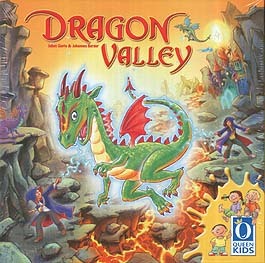 In a hidden valley lives a little dragon family. Only a few magicians and sorcerers know about the dragons' existence. Today, the little dragon younglings are visiting the enchanted forest to play fire ball with the sorcerer's apprentices. But the grumpy magician Razandar is not amused. He fears that the hot lava ball rocks will damage his beautiful mage tower. Uh oh!!!!! Razandar is returning from his walk. No fire ball today!!!! You must hurry and get the younglings back to their valley before Razandar gets home. Only magic can help you now! Grab your wands and conjure the dragon younglings back to the hidden valley before Razandar reaches his tower. A magical race is about to start.